If you are looking for information on the RejuvaSpine franchise business opportunity, RejuvaSpine franchises or RejuvaSpine franchising, then you have come to the right place. A RejuvaSpine franchise presents a unique opportunity for you to capitalize on the booming healthcare industry with no medical expertise required. Health care represents a two trillion dollar industry and is experiencing rapid growth - expanding at 2.5 times the rate of all industries. With our highly effective treatment program for back pain, a RejuvaSpine franchise gives you the ability to appeal to a wide demographic. Approximately 80% of Americans experience back pain at some point in their lives, and 76 million baby boomers represent a constantly growing market for back pain treatment. A RejuvaSpine franchise provides entrepreneurs the opportunity to rapidly and successfully participate in what is, without question, the wealthiest industry in the world - the healthcare industry - by utilizing a proven cash-based model. A tremendous need exists in this booming industry and the demographics support strong growth for years to come. This business is highly rewarding for individuals who enjoy helping others. As a RejuvaSpine franchisee, you can make a difference in your community, in the lives of others, as well as your own. RejuvaSpine clinics offer non-invasive, drug-free, painless spinal rejuvenation utilizing an advanced, FDA-cleared treatment device. 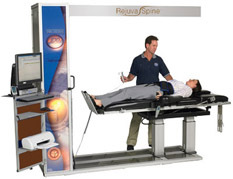 This treatment, known as IDD Therapy treatment, is a pleasant, highly effective program design to restore spinal health and pain-free spinal function. IDD Therapy treatment is also long-lasting and backed by clinical studies and research articles. With an impressive success rate, thousands of patients have already experienced dramatic pain relief and healing. Forget the headaches, the hassles, the fourteen-hour workdays. If you're like most franchise owners, you purchased a business to take a step away from the day-to-day grind. You want the freedom to spend time with your family and enjoy the benefits of business ownership. Owning a RejuvaSpine clinic means putting your business to work for you. With RejuvaSpine, you have the opportunity to be as involved as you like. You can look forward to a day at your upscale yet relaxing office, or you can hire a professional team to run things for you. What could be more appealing? At RejuvaSpine, we have built a foundation of a proven system and programs unique to our industry. The result is a simple, easy-to-follow business model with low overhead and high margins. Millions of Americans are seeking out and paying for their own health care services and procedures. RejuvaSpine clinics offer direct patient care at affordable prices, without the bother of insurance paperwork. RejuvaSpine clinics exist to serve people by helping them take control of their own wellness. People welcome the chance to make the decisions that will improve their health. Your clinic will provide a service that literally improves people's quality of life- and that's a rare and wonderful thing.